« Some Coastal Scents mica swatches. Huzzah. By Laura. Posted April 28, 2009 at 10:04 pm. 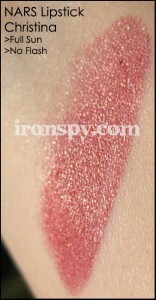 A very, very pretty raspberry shade with subtle gold tone shimmer and a frost finish. Goes on creamy, but dries out almost like a matte lipstick would, but it isn’t too drying in my opinion. Great shade for spring and summer.